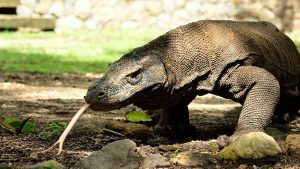 We make a package of Komodo Trek Full Day Trek for you who want to explore the islands of Komodo National Park and visit the extraordinary World Heritage (The new 7 wonder of World) You can also see ancient animals KOMODO DRAGON, PADAR ISLAND, PINK BEACH and KANAWA in a day visit Only! After breakfast guide will pick you up at hotel utau Airport and directly transfer to Labuan Bajo tour dock to then use fast boat to Padar Island. Along the way you will enjoy the beautiful panorama of the island – the island and the fishing village is amazed. On Padar Island guide will take you trekking to the top to see the landscape panorama and indentation of unique three-color beach that is amazing. After that, the journey continues to the island of Komodo. Arriving at Komodo Island you will be greeted friendly by Ranger / Pawang Komodo who will guide you in the exploration for trekking observing the survival of KOMODO stars and other wildlife in their original environment such as: Wild buffalo, Wild horse, Monkey, Deer timor, Boar, snake And several species of endemic birds. After the trekking finish back to the boat for lunch. Your journey will be on to Pink Beach for Snorkeling, watching the millions of beautiful sea creatures and coral reefs and relaxing on Pasir Pink a gently stunning beach. Next, take a trip to the last snorkeling destination on Kanawa Island where you will be spoiled again by the beauty of white sand beaches and the diversity that is owned by Kanawa Island. After you finish relaxing and snorkeling you will be driven back to Labuan Bajo, to the hotel where you live.